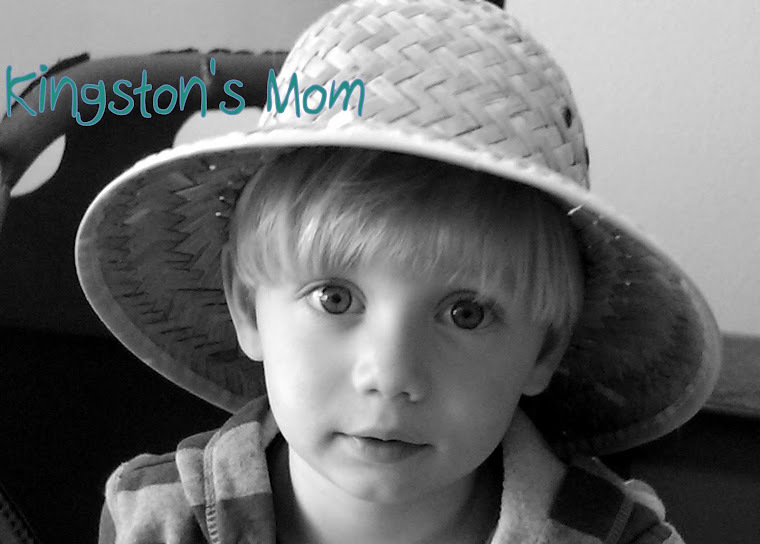 Kingston and I went to KidsFest in Manteo on Friday. We had a bunch of fun! Kingston had fun playing with the bubbles. Well, he really more got bubble "juice" on his hands and then wiped it in his hair, but whatever! I wasn't sure I would ever get him away from the building blocks, cars and trucks. But eventually we moved on. The Outer Banks Child booth had blank note cards and stamps and Kingston was really into "stamp-stamp"ing his card. The card was lost at some point in the day. Hey, if you happened to be at KidsFest and found a fabulously stamped card maybe somewhere around the tunnels of the obstacle course, that was probably Kingston's. Bummer. It was one for the scrapbook. After cruising around some more, there began to be a rumbling among the kids. You had to listen carefully to hear what they were saying. Not. "Ice Cream!" Word about the ice cream spread like wildfire! I was trying to pretend we didn't hear the word, seeing as it was only 10:30 in the morning, but to no avail. Thanks, Dairy Queen, for ruining our lunch, but making Kingston a very happy kid! Kingston was really interested in the shark table from the Aquarium. The nice lady was talking to him about shark's teeth and he was really paying attention. All of a sudden a group of about 6 older kids came up and pushed him out of the way. Oh well. It was fun while it lasted! My friend Eden and I had planned to meet and "do" KidsFest together. Our small children had other plans. They didn't really seem interested in each other, much less the same activities when we got there. Luckily when we met back up later, the two hit it off. They danced, giggled and then held hands as we walked out of the park. So cute. We walked to Ortega'z for lunch and had a great meal. It was a really fun day and we enjoyed spending it with Riya and Eden, and seeing lots of other friends. Now what to do on a potentially rainy Sunday. . . Maybe we will go check out those sharks again at the aquarium. Have fun at the Aquarium! Great place to go especially on a rainy day. Kingston has fun no matter where he goes. What a versatile guy! I am glad to see that Kingston is getting along great with his broken collar bone! Hey, didn't you know that ice cream is the best food group in the world and you need some at least once a day!